Last but not least, i made this late today. Phew! Must say it's a productive holidays for me. Wish there are more holidays....LOL. This agate cab is to replace the donut pendant I made few weeks back as the color of the donut pendant is a bit off fr the necklace. 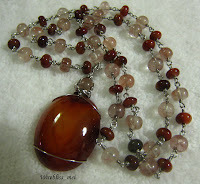 The color of this agate cab looks much better with the rutillated beads necklace but a bit huge/heavy though. Plan to look around for a rutile cab and it will be perfect. I love the wrap on this cab! Awesome! I've never been good at cabs and would love to see how you wrapped the back! Oh and the tutorial?? LOVED IT! I made my first Twice Around the World last night and adore it! Your tutorial was Super. In my own self interest, Don't sell them! LOL! But seriously, your tutorial is one of the best, I would definately market them! Thank you Christina for your kind words. I will show u the back side of the cab one of this day when i hv taken a picture of it. Its quite simple actually. You would be able to figure it out once you have a look at it.